“Well a really long time ago I was working security. 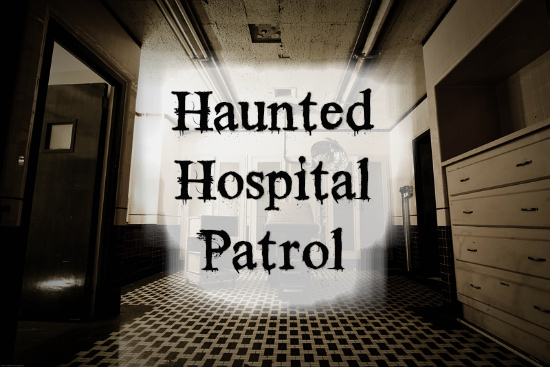 I was sent to fill in for somebody one night at this hospital which was no longer a hospital. It was really only kept for filming and security was hired basically to keep away squatters and vagrants and vandals and that, you know, trust me, I'm an LA girl you do not have to turn your back very long to get either of them. In the big cities, it's just par for the course. So I showed up, and the guy that I was relieving showed me the ropes, told me what I had to do and told me that there would be a guy as back up. This guy was welded to the seat in the lobby with a mini TV in his lap and earphones on his face so he's pretty much deaf and blind to the world. He could have been a scarecrow in a uniform. So I'll just refer to him as 'scarecrow' from this point on. So as I leave the lobby and starting to patrol the building. Even though nothing was happening there was a very eerie dead quiet about the place. And the appearance, it looked like something out of 'The Twilight Zone.' I mean, it looked like maybe a minute ago it was a super busy hospital and then everyone just disappeared because there was just books and file folders scattered about, the phones were off the hook, medical instruments scattered about. It reminded me more of like the Christian notion of the rapture. Like, snap, everyone's gone! That's exactly how it looked and as I'm going through the walkways, some of the hallways had windows and out of the corner of my eye, I would see, like, people, you know, there is one old man in the hospital gown and it looked like he had a monitor on wheels or an IV on wheels, I'm not sure which, and it looked like he was floating, I guess. It's because as he was passing through the hall, you didn't see a gate or any steps. I could only see from the torso up. The rest was blocked by the hallway.